I was 13 when a boy in 7th grade introduced me to the metal band Guns N’ Roses. Before long, my room was plastered with pinups from Heavy Metal magazine and Hit Parader. I was obsessed. I’m not sure if it was the music, with its chilling guitar riffs and explicit language, or the long-haired, tattooed lead singers, but I was soon in love with the likes of Axl Rose, Jon Bon Jovi, Bret Michaels, Sebastian Bach, and many more. I knew their birthdays, their tour schedules, and the lyrics to every song. Of course, I rehearsed the conversations I would have when we finally met. Fast-forward some 25 years (or more) and I’m married, the mother of two… and a rabbi. But when Guns N’ Roses announced their #NotInThisLifetime reunion tour, I bought tickets within the first hour of sales. This was an experience that I was not going to miss. I may have worn an outfit from Ann Taylor—not cutoff jean shorts and a halter-top—and I may have taken two Advil before the show, but I still felt like I fit in with the other 60,000 fans in attendance. Most were around my age. And while I likely did not share political views, religious practices, or levels of inebriation with the people around me, what I did share was a great sense of nostalgia for the days when Axl and Slash ruled the radio and stole our hearts. For just one night, I was 13 again. It was everything I’d imagined it to be (except that sadly, I did not get to meet Axl Rose, despite tweeting at him!). And yet, for the current me—the grown up, mature woman who listens to folk music or NPR and is asleep before the guitar solo—I did not feel the connection I had hoped to feel. Sure, it was great to be 13 again, and sure, it was a fantastic trip down memory lane. But it did not renew my interest in Guns N’ Roses, and if anything, I’ve sworn off all noise until I can hear with both ears again. Being 13 and being passionate about something—anything—is great, but it’s not going to last us into our 30s, 40s, and beyond. So why do we expect so much for our own bar and bat mitzvah-aged kids? Why is Judaism so focused on getting children to this important milestone at the age of 13, but not beyond? As a parent, I’ve already fallen into this trap: My son turns 7 this year, and I have been encouraging him to pay attention in synagogue because we are more than halfway to his bar mitzvah! Yes, I admit this was a “not-so-wise” parenting move, and I’m working to fix it. Judaism is more than the goal of a single special day and a family milestone; I want it to be a permanent fixture in my children’s lives, a language, a culture, a set of values, a journey of experiences, and so much more. I don’t want my children to dust off their Jewish relics like I did with my GN’R CDs (remember those? ); I want them to keep using, enjoying, and growing from our Jewish tradition. I want them to realize that being 13 is nice, but being an adult who is still on a Jewish journey is even nicer. My feet are still recovering and after a few more cups of coffee I may be able to function. 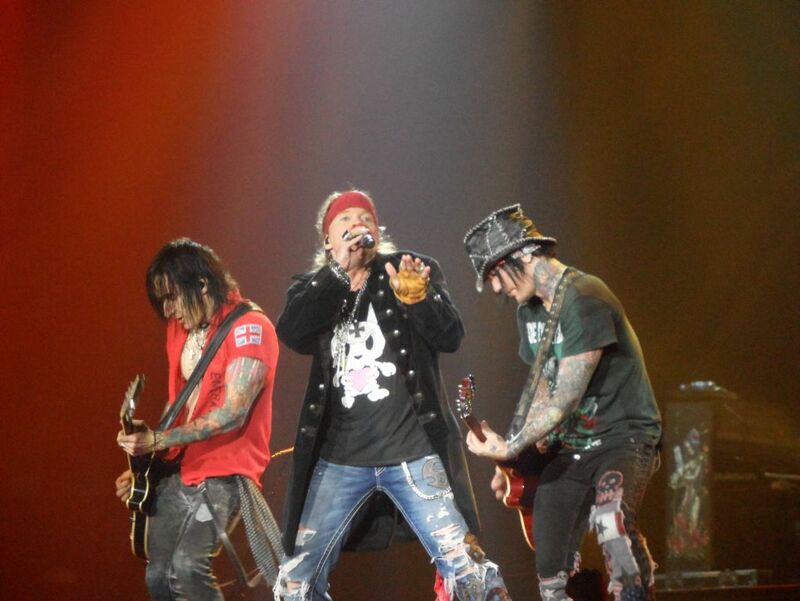 I am so glad I had this incredible experience of attending a Guns N’ Roses concert. And I am grateful that it helped me look to the past one last time, and then to the future—our family’s Jewish future—with a new sense of meaning and engagement.